Why don’t you take a shot with the Minipresso? Starting the day right might mean waking up on the right side of the bed for some people, while others would think that having the correct breakfast, accompanied by that perfectly brewed cup of coffee, is the way to go. However, if you happen to be an avid coffee drinker who simply cannot get enough of this caffeine-infused beverage, how about taking a slightly less traveled route with the £49.99 Minipresso? 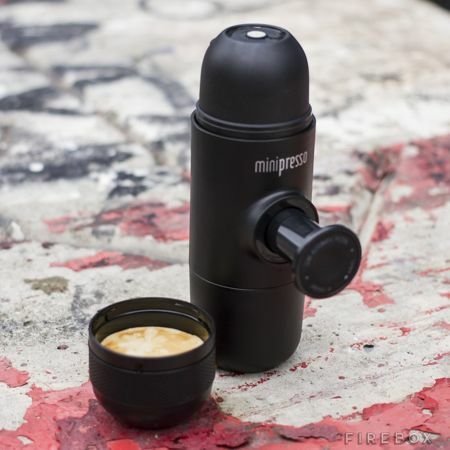 The Minipresso is an ingenious hand-powered portable espresso maker that works differently from most of the other traditional espresso makers that are in the market. For instance, it will require on you to pump it to brew coffee according to your liking, where this small device is capable of fitting into your pocket – and it comes with a built-in cup, too, now how about that for portability? In other words, the Minipresso really lives up to its name as this is the smallest, lightest and most versatile handheld espresso machine ever. All it takes would be a few pumps on the Minipresso and the optimal pressure for coffee extraction is achieved. 13 pumps should be good enough to deliver a tiny shot of coffee, while 18 will deliver a scrumptious espresso and 28 pumps would mean you will stay awake all night.